When Did J.C.W. Ingram Arrive in Texas? And when was the town of Ingram, Texas planted? “Never let the truth get in the way of a good story”, we’re told. And, that’s fun. But, is it what we want our history books and monuments to reflect? Should we “change” or can we “correct” history? Is the correction of “facts” changing history or simply aligning our stories with history? One of my great grandfathers was named John Charles Wesley Ingram. Most of what is written about his arrival in Texas is wrong. Three quick examples repeated with small variances in many different sources illustrate what I mean. Two more examples describe his arrival in Texas. Once an event is incorrectly reported, that incorrect report may travel around the world. Never has this been truer than in the age of the internet. And we should also remind ourselves that not everything written in books and published is true. Sometime, somewhere in the last century it was reported that J.C.W. 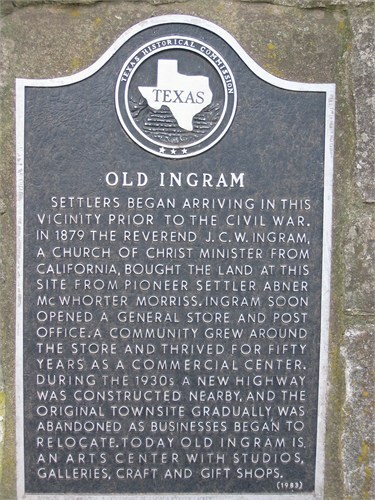 Ingram arrived and bought land in Texas in 1879. This “fact” is now part of multiple online articles, family trees, newspaper articles, county histories, Texas guidebooks and several expensive historical markers in Kerr County, Texas. The problem, this “fact” is wrong and to record it as such is inaccurate. So, can we change or correct history? Events which have taken place in the past. The stories (oral history) or recordings (written history) of those past events, accurate or inaccurate. His/Her-story. How an individual chooses to research, hear and interpret available “facts” concerning an event in the past and report those “facts” to others. I visited Kerr County in the spring of 2013 with by wife, brother and sister-in-law. We were looking for land and marriage records…and of course, antiquing. We were fortunate to meet Irene Van Winkle of the West Kerr Current newspaper. She was surprised and concerned, as any conscientious reporter would be, of a possible error in the dates for the Ingram’s arrival in Texas. She had reported this erroneous “fact” more than once herself. I shared with her my concerns and she expressed her intent to look into the matter. Here are some facts I’ve found related to J.C.W.’s arrival in Texas. According to the Pacific Rural Press of California dated May 17, 1879, J.C.W. Ingram is elected as an officer of the Lakeport Grange Hall #76. J.C.W. Ingram was a well-known, well respected and well-to-do man living in Lake County, California during the middle part of the 1800s. There are many records to illustrate these facts. For now, I’ll refer you to a biographical sketch of Ingram found in the “History of Napa and Lake Counties, California: Comprising Their Geography, Geology, Topography, Climatography, Springs and Timber” written by Lyman L. Palmer, A.M., Historian and published by Slocum, Bowen and Co. of San Francisco, California in 1881. The digital copy in my possession is a photocopy of a first edition donated to Harvard College Library. Palmer signs the preface to his book in November of 1881. The Ingram sketch beginning on page 250 closes with the mention or six surviving children; Luella C., John L., Mary R., Sarah A., Ruth and Maud. The article ends with the Ingram’s loss of two sons; William R. and Preston. According to cemetery records William Riley Ingram died in Lake County on November 30, 1878. He’s buried in the Hartley Cemetery which began in 1860 as a Masonic Cemetery. J.C.W. once served as Worshipful Master of this Lodge #199. I include this because it is a sequence of events happening prior to the Ingram’s leaving for Texas. According to the 1880 Federal Census, John C.W. Ingram is a 51 year old farmer living in Scotts Valley Precinct and Big Valley Township. In his household is Mandana A., 46; John L., 17; Mary R., 14; Sarah A., 11; Ruth, 8; Maud, 6; Laura A., 24 (We know this to be the widow of William Riley); Arthur O. Lillie, 4 (a son widow Laura brought into her marriage with William) and Ethel Ingram, 11 months (Laura and William’s daughter). Enumerated 21st day of June 1880. This same John C.W. 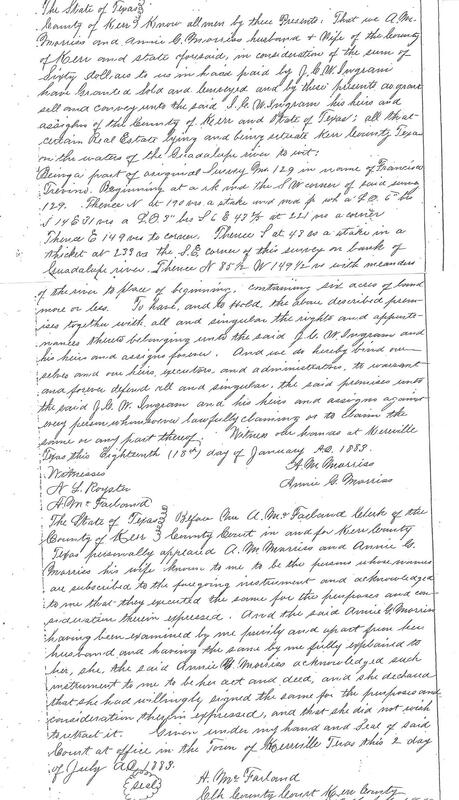 Ingram has his farm enumerated with the following facts recorded on 21st day of June 1880 reporting his production for the year of 1879 in Scotts Valley, Big Valley Township of Lake County, California. Acres of land: 140 tilled, fallow or in rotation. 6 acres meadows, pastures, orchards or vineyards. 105 acres woodland or forest. Farm values: $8,000.00 for farm including buildings, land and fences. $150.00 for farm implements and machinery. Value of livestock, $300.00. Cost of building or repairing fences in 1879, $350.00. Amount paid for wages in 1879, $500.00. Weeks hired laborers in 1879, 52 weeks. Estimated value of all farm production for 1879, $1,200.00. Acreage mown in 1879, 10 acres. Acres not mown, 230 ac. Products harvest in 1879, 20 tons of hay. Horses on hand as of June 1, 1880, 7 horses. Mules on hand as of June 1, 1880, 1 mule. In the precinct of Lakeport, in the county of Lake, CA, several miles to the southeast of the Ingram farm, John F. Burger is enumerated in the 1880 census 18th of June. Included in his household is his 25 year old son, George F. Burger. According to the Ag schedule for this farm (1880 Federal) it is larger but valued just over half of the Ingram’s place. In the May 11, 1882 edition of the San Antonio Evening Light there is an announcement of a business dissolution. J.C.W. 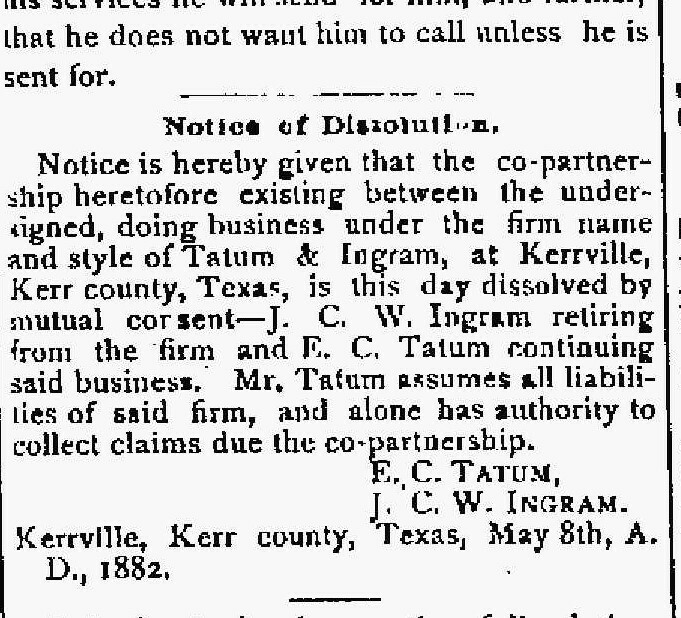 Ingram of Kerrville, Kerr County, Texas dissolves all business ties with E.C. Tatum as of May 8, 1882. Mr. Tatum assumes all liabilities of the firm, and alone has authority to collect claims due the co-partnership. According to the research in Jim Wheat’s POSTMASTERS & POST OFFICES OF TEXAS, 1846 – 1930 (http://www.rootsweb.ancestry.com/~txpost/postmasters.html), John C.W. Ingram became Ingram, Texas’ first postmaster on October 31, 1882. According to The Official Record of the United States Vol 2, containing a list of the officers and employees in the Civil, Military and Naval Service on the first of July 1883, J.C.W. Ingram is the postmaster of Ingram in Kerr County, Texas. Deed records copied from the courthouse records in Kerrville, Texas in May of 2013 tell us J.C.W. Ingram bought lots from C.E. Mitzschke in Kerrville in February of 1882 (Vol G p. 71). This is not the land he will later purchase west of town. The land he purchased from the Morriss family on which he built his store and ran his post office on the Guadalupe River was purchased in January 1883 (Vol H pp 8, 9). The August 27, 1883 edition of the San Antonio Light newspaper has this item in the Hotels report: “J.C.W. Ingram and Frank Coleman, prominent citizens of Kerrville, are at the Central”. (Notice the phrase “of Kerrville”.) He had stayed previously at the same hotel in June of the same year. How we interpret and report these facts will determine how close our story is to history. What may we learn from these facts about J.C.W. Ingram’s arrival in Texas? The facts not only give evidence the Ingrams were NOT in Texas in 1879, they also imply he was not even thinking of coming to Texas until as late as 1881. J.C.W. accepted a new office and responsibility in Lakeport, CA in May of 1879. J.C.W. is the head of a household in Scotts Valley, CA in June of 1880. He can’t be in two places. J.C.W. reported in June of 1880 he spent $350.00 in 1879 on his fences. He spent $500.00 on labor. He reports only having 7 horses, 1 mule and no other livestock requiring fencing. That’s a very large financial outlay. It’s over 10% or the total value of his property, buildings, crops and farm implements! That kind of investment does not indicate to me he’s planning to sell his place. It’s already prime real-estate. If you’re planning on leaving the state, let the new owner invest in his own fences and oversee the labor. The biographical sketch of J.C.W. mentioned earlier was published in 1881. To write this piece it would have been necessary to interview J.C.W. or someone very close to him. The preface was signed in November 1881. Harvard College Library obviously received an advanced copy because their copy is stamped with an October 1881 receipt date. The interview would have been between the death of William in late 1878 and sometime in early 1881. John F. Burger purchases this farm and ranch in the fall of 1881. J.C.W. would need to be in California to oversee this sale. J.C.W. and Mandana’s daughter Mary Rebecca married John F. Burger’s son George Frederick (Fred) on December 7, 1881 and the Ingram family left for Texas the next day. The facts all support this account. J.C.W. is in Texas before May of 1882. We know this because he’s already dissolving a partnership with E.C. Tatum. This implies he arrived in Texas, agreed to enter a business partnership and arranged an agreed upon dissolution of that partnership all in a few months’ time. I wonder what happened? The 1879 San Antonio City Directory lets us know Elisha C. Tatum was a young clerk working for L. Moke & Co. while living in the home of his father. In the 1880 census he’s 23 and living with his sisters Viana Gillis (widowed or divorced with two children) and Sally Tatum who is 15 and still in school. His occupation is “clerk”. In the 1881 San Antonio Directory he’s listed as “E.C. Tatum and Co. (Elisha C. Tatum, Mrs. Viana Gillis), groceries, provisions and proprs Buffalo Camp Yard, 25 and 26 n Flores. See advr’t.” Buffalo Camp Yard was a well-known place to gather and move supplies from San Antonio to points west. There was a regular freight run from the Buffalo Camp Yard through Kerrville and on to Comfort, Texas. It would have passed near or through the land J.C.W. would eventually purchase on the Guadalupe River. 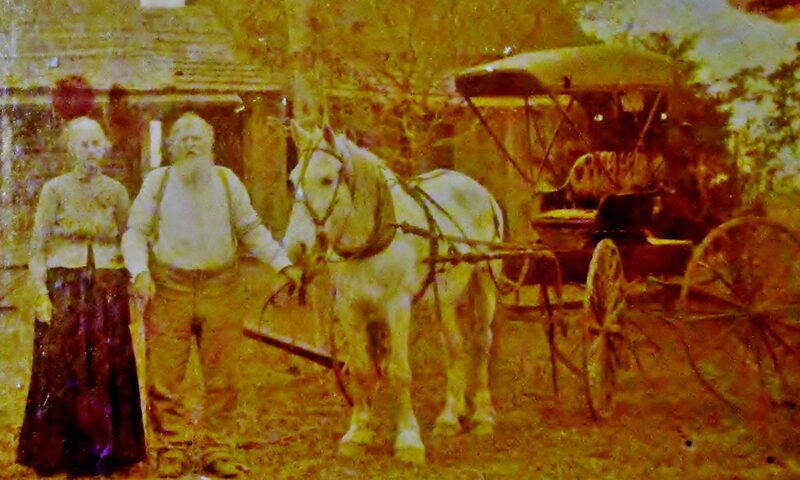 It may have passed by his property in Kerrville purchased in February 1882. So, let me speculate. By early 1882 a young, aspiring business man and his sister need a cash infusion into their grocery and supply business. Perhaps it was Frank Coleman, the brother-in-law of Elisha Tatum, who introduced Tatum to J.C.W. Coleman and his wife lived in Precinct 1 of Kerr County (primarily the city of Kerrville) near where J.C.W. bought those lots in February 1882. He and Coleman are described in the San Antonio newspaper in 1883 as “prominent citizens of Kerrville”. J.C.W. had plenty of capital to invest and may have been looking to get into business before arriving in Texas. The young salesman “sold him” and they entered a business agreement. Something happened. Perhaps J.C.W. got a clearer picture of the person or the condition of the business. He appears to have pulled out of the arrangement without recovering his cost or any future income from the business. If one needs a building or a piece of land to have a post office and be the postmaster of the new berg of Ingram, we can say J.C.W. did not own the land now known as Old Ingram until January 1883. He may have owned or invested with his friend Frank Coleman in Kerrville prior to and/or in 1883. It may have been business or ministry, or I suspect both, but J.C.W and his family began their time on the Guadalupe River in 1883. So, if you need a property or a building or a post office to have a town and or have it named after you, Ingram was not birthed until 1883. Unlike most travel guides to this date, Hill County Visitor.com gets it right. The facts say the Ingrams left California in December 1881. They were in Texas by February of 1882 and purchased land in Kerrville. They then purchased the land where old Ingram sits from the Morriss family in January 1883. J.C.W Ingram arrived in Texas in early 1882. The seed for the town of Ingram was planted in 1883. Grief over the loss of his sons? The need for a new adventure or challenge? Does anyone have a letter from J.C.W. explaining it? Please feel free to share it here.